Marvel has almost always placed an unusual emphasis on the activities of its alien species, with the business of the Kree, Shi’ar and Skrull species of particular interest to humanity at large (not to mention the activities of Galactus, his Heralds or the Watchers). With that in mind, the powers that be have recently taken the initiative of relaunching Nova, telling the otherworldly adventures of the golden-helmed adventurer. The last time we saw the title character, AKA Richard Rider, he was in rough shape. Flying full-force into an impenetrable Phalanx force field generally has that kind of effect on a guy. So, to give the man some time to gather his thoughts and reassemble his body, the Worldmind computer (the source of Nova’s power) has gone to the trouble of choosing a temporary assistant: a Kree medic named Ko-Rel. 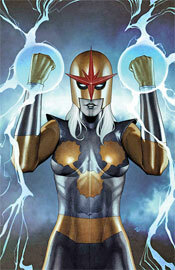 She’s the public face of this issue, and wields the same powers and apparel as Nova himself. Dan Abnett and Andy Lanning have brought a surprisingly shrewd, entertaining story to the table in this issue. They do a nice job of developing the temporary supporting cast to accommodate the new lead, take the reader on a roller coaster ride that keeps them guessing, and finish things off with a final page that had me legitimately interested in the follow-up. Never underestimate the value of a good cliffhanger. Sean Chen and Scott Hanna deliver safe, solid visuals in the vein of Greg Land. Chen’s visual style is picturesque, almost to a fault. The characters look too realistic, in that they never seem overly dramatic or stylized. I prefer an artist who takes little more creative liberty with their work, but he’s good at what he does and I can respect that, even if it’s not to my taste. At worst, he knows what he’s doing and that’s enough to stand out from the horde. Chen does get a bit crazy with the speed-lines from time to time, but it’s never so bad as to spoil the composition. It’s the use of silhouettes that seems to be his real interest, and also his greatest strength. He introduces them to imply depth, to further emphasize the power of a bright light, and to simply deliver a cool visual, but they’re never overdone or forced into a situation. Brian Denham fills in for five or six pages throughout the book, and provides close enough a replica of the other artists’ style that I didn’t even notice the change. That’s good, too, because I really can’t stand the disruption of a drastic artistic shift in the middle of a book. It completely pulls me out of the immersion. Having finished this issue, I’ll actually be keeping my eyes peeled for the next, where before I never would’ve given it the time of day. Do yourself a favor, borrow this one from a friend. If you can hang with the artist’s style and the prospect of an almost exclusively blue-skinned lead cast, you might lose yourself in the quality sci-fi storytelling.